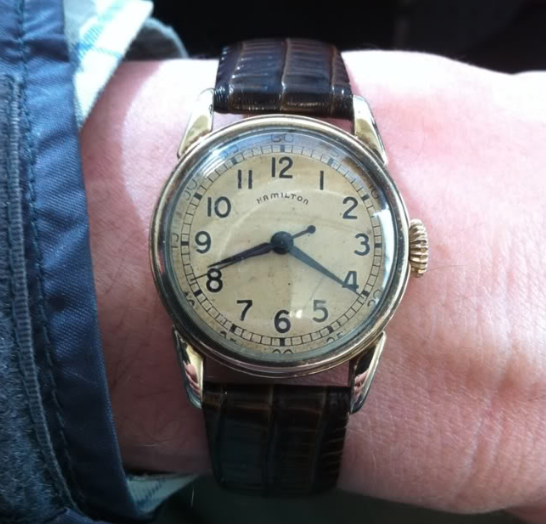 At the conclusion of WWII in 1945, Hamilton was able to retool operations to start making civilian time pieces again. I've heard statistics that making a movement took the better part of a year from start to finish so civilian models were re-released slowly through 1946. One of the new models introduced after the war was the Secometer. Like the Sentinel introduced in 1940, the Secometer utilized the same 6/0 sized, 17 jewel 987S movement with a central sweep second hand. In addition, it used the same gold filled case as the Sentinel. The only real difference was the dial. Initially it was produced only with an AGN dial but later years offered an enamel dialed version as well. The 987S movement was used for military watches during the war and it features a hacking feature where the movement stops when you pull out the crown to set the time. Push the crown back in and it restarts. The Secometer was produced through 1948. 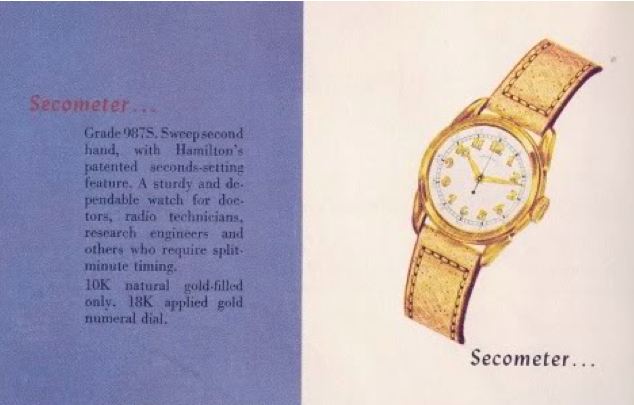 In 1948 it was offered along with the Secometer B - a similar watch that used the newly introduced 18J 748 movement with sweep second hand, as well as the Secometer C, which came in a solid gold case. The Secometer is a very classic design in my opinion, perhaps ahead of it's time as sweep second hands were relatively uncommon prior to 1948. I like the Secometer and it always catches my eye when I see one for sale. I have one...problem is it runs fast..2 minutes a day. It’s easy. It’s also easy to turn it into a non-running watch and a very expensive repair. Do yourself a favor and have a watchmaker properly service the watch. It should be done every 3-5 years if you’re going to run it. I'm not a collector...just wanted to open the case. If you won't tell me, I'll take my query somewhere else. YAWN...I'll take my watch queries someplace else. Hi Dan - Long time lurker, first time poster. I'm compelled to comment on this thread because I want you to know how invaluable your blog has been, and continues to be, to my Hamilton repairing and collecting journey. Less than a year ago I got bit by the watch bug and quickly found your blog during my research. 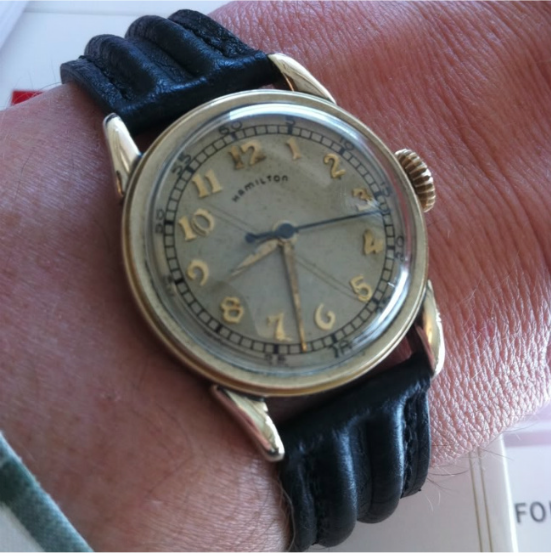 The detailed photos, the tid-bits of Hamilton history, comments on design, links to historical sources...everything you've done so far has made me a better hobby horologist and added to my joy. I appreciate the passion, knowledge, and experience that you share freely with the community here, on your Instagram, and on the forums. Is folks like you that help keep history and this hobby alive. Keep doing what you do. I know I'm not the only one that you've helped and inspired.